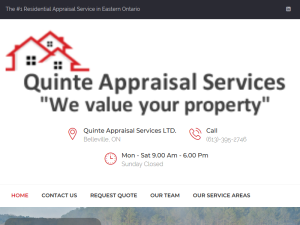 Quinte Appraisal Services LTD, was founded on the principles of responsibility in custom services, efficiency and consistency reliable expertise. Our appraisers are qualified, designated, knowledgeable and local. Servicing the Kingston, Belleville, Trenton, Madoc, Picton and surrounding areas, we are committed to providing competent and professional third party real estate evaluations and advisory services.